I think it has become painfully obvious that I am a major chocolate fan, did you count how many chocolate recipes I already created?! My favorite cocktail is even chocolate, a chocolate-tini (try it, you’ll never go back to any other mixed drinks, I promise!) However, family is there to pull us out of our comfort zones and push us in new directions. I have a lovely daughter who gets very upset when Mommy makes yet another chocolate recipe. She takes it as a personal offense! She will ask me “When are you going to make a vanilla dessert?” and I just shrink down into one of those ‘geez I am the worst mom’ thoughts. Then I came up with a cool recipe that could help us meet in the middle. 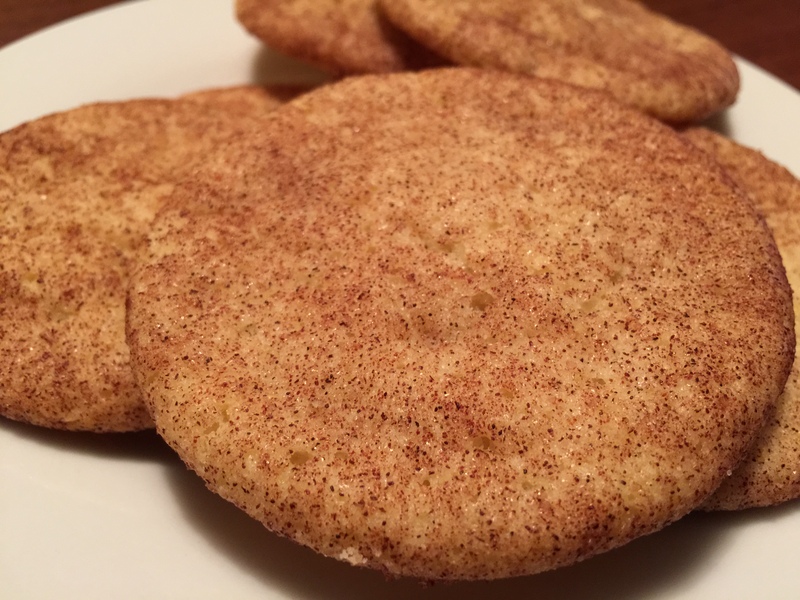 We are both cinnamon fans, so I thought a nice snickerdoodle recipe might be great for us to work on together. My daughter felt especially empowered, as I let her make the dough all by herself (since we doubled the recipe, it helped her learn some math along the way)! Parenting is a series of a zillion moments, some up, some down. Our baking afternoon was filled with moments of which we both felt proud. That’s what it’s all about! Below is doubled for you, so you can make enough to share, without the math lesson. Tip: Only use Madagascar vanilla or organic pure vanilla extract, never skimp on ingredients, especially the flavor components! Preheat oven to 350 degrees Combine the flour, cream of tartar, baking soda and salt in a medium bowl – whisk it together. Cream the sugar and butter in the bowl of a standing mixer, or a large bowl with a handheld mixer. Once combined, add the eggs one at a time and combine thoroughly, then mix in the vanilla. On low speed, slowly add in the dry ingredients. Chill the dough by wrapping in clear wrap splitting it in two big balls by putting it into the refrigerator. Chill 2 light cookie trays in the refrigerator for 30 minutes as well. While waiting for the chilling dough, set up your cooling racks, I like to put aluminum foil under the racks to help with clean-up. Also get out 2 more light cookie trays ready to put into the refrigerator once you take the first 2 out, you will be able to make 4 sheets worth with this recipe. MIix the sugar and cinnamon together into a shallow bowl that will work for coating your cookies. Pull the dough out, roll 1 inch balls and cover them in the cinnamon sugar. 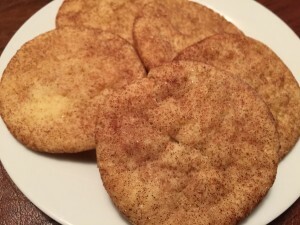 Leave the cookies room to spread, cook for 10-12 minutes. Pull out the second dough ball and second set of trays and roll those while the first 2 batches bake. I cooked 2 trays at a time but switched them at the 5 minute mark, to make certain they would cook evenly. I can tell they are done by the center looking dry, just be careful because the bottom should not get dark. 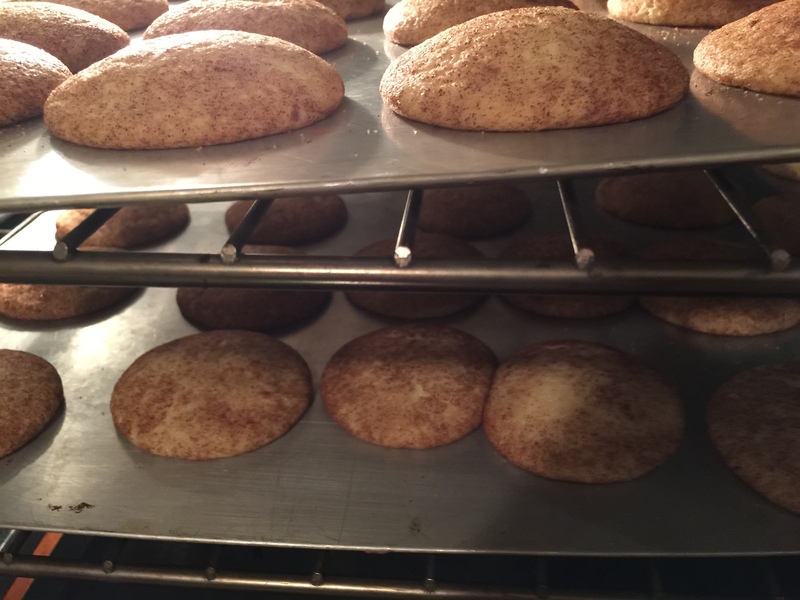 I did not use parchment paper on the trays and the cookies came off without difficulty, just take them right off and get them on the cooling racks. The cookies puff up in the oven, then flatten as they cool which worried me the first time a made them. But that is not an issue, they cool down to a crunchy and tasty cookie.